The Amateur Traveler interviews Rod about his trip to Marrakesh in Morocco: Jemaa El Fnaa market, The Medina, the casbah and more. 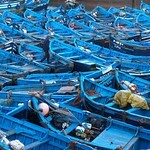 Adventure in Morocco with Paris thrown in for free (airfare). Some surprising facts about Moroccan food. This really is an excellent description of Marrakech. I loved this place so much that I now live here! My name is Sofia, I live in San Diego, CA. I am sure you get this a lot… But I ABSOLUTELY LOVE LOVE LOVE your show. I often listen to podcasts at work, in the car, when I am in my “dreaming” mode… All the time! Your ability to ask the proper questions and help the narrator express himself in a descriptive manner astonishes me. Chris, I am planning a trip to Morocco with my friend Jasmine from Australia and we will be traveling to Morocco. I have heard your Morocco podcasts and I wanted to ask your professional opinion regarding our trip. We are planning to go to Morocco May 1-6, 2016, we have a limited budget, and a limited amount of time. What do you suggest we do? Do you know any tours that we can take? I know you are busy… So if I don’t hear back I understand! Keep up with your amazing podcast! Rock on with your bad self! Sofia, With just 6 days I might focus on just a couple of places, depending on what you like. Maybe Marrakech and Essaouira or just Fez. It would be easy to spend all of 6 days just getting places.